Bumper bras and plastic hood deflectors take away from your cars appeal, and they most often are plain ugly. 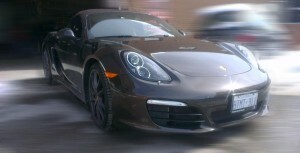 Keep your vehicle looking like it should, with 3M Paint Protection Film (PPF). 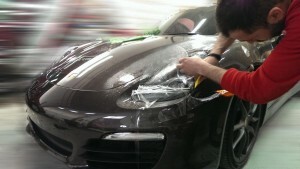 3M PPF is an invisible layer of thick clear vinyl that provides exceptional protection against stone chips and scratches. The application is slightly different than on vehicle graphics. It is a wet application and takes longer then installing simple decals. It does not need to cover the entire vehicle. Applying PPF to specific areas which are prone to stone chips is more than enough. 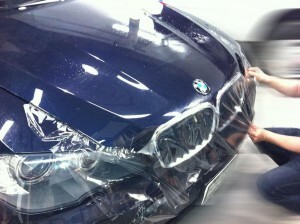 We usually recommend covering the front bumper, fenders, hood, and mirrors with PPF. This provides excellent protection on the front of the vehicle. Alternatively depending on the vehicle’s coverage on just the hood may be enough. PPF can save you money down the road. 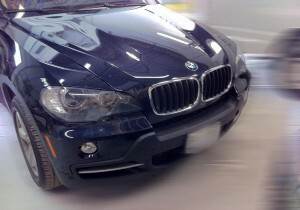 It helps to keep the resale value of the vehicle by keeping the front looking new and stone chip free. People often have to repaint their front ends because they get destroyed thorough regular driving. The stone chips may even cause a rust to appear. Having PPF may prevent the potential hood replacement due to rust. PPF is a must have for any new vehicle.